Sig Sauer and Hogue Knives have teamed up to bring you some exciting variations on some of Hogue's most popular knives. Sig Sauer is a world renowned firearms manufacturer who supplies premier weapons to military, law enforcement, and commercial users around the globe. 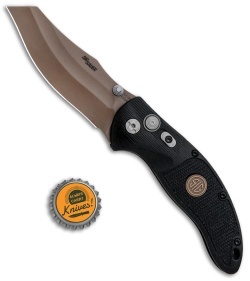 This EX-04 model sports an FDE finished wharncliffe blade and a black G-10 handle with a Sig Sauer logo inlay. 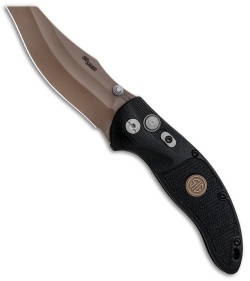 154-CM blade is ground with two hollow bevels, which add visual interest while maintaining utility. 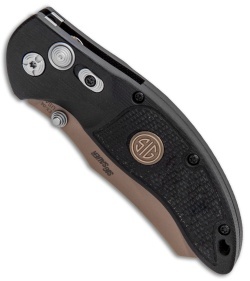 A perfectly contoured G-10 handle provides a comfortable, high performance grip. 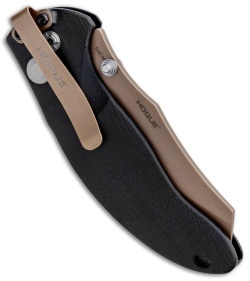 Includes a stainless steel clip for tip-down pocket carry.